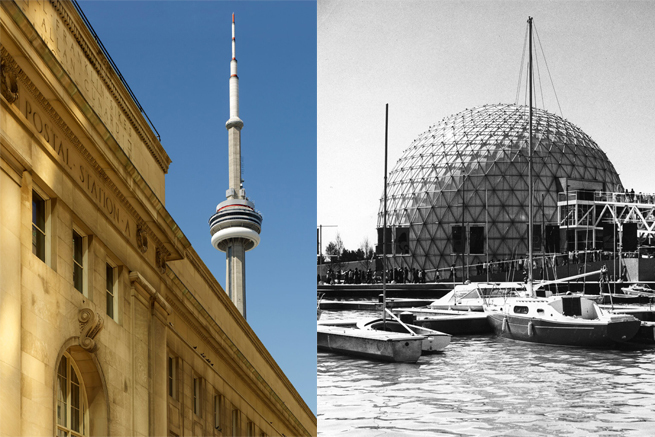 OTTAWA, ON, April 25, 2017– The Royal Architectural Institute of Canada (RAIC), in partnership with The National Trust for Canada, announces the Ontario Place Cinesphere and Pods and the CN Tower in Toronto as recipients of the 2017 Prix du XXe siècle – recognized for their enduring excellence and national significance to Canada’s architectural legacy. Ontario Place’s dramatic structures by Toronto architect Eberhard Zeidler made the waterfront park an instant landmark. Completed in 1971, the Cinesphere (known as “the Bubble”) is a 35-metre-wide dome made from steel and aluminum tubes that housed the world’s first permanent theatre for IMAX technology. A bridge-like suspension structure elevates the five inter-connected Pods over Lake Ontario. The Pods were first used to host a multimedia exhibition but were designed to be flexible and accommodate different functions. At the most basic level, each Pod is a three-storey box, encompassing 743 square metres. Rising 553.33 metres above the Toronto skyline, the CN Tower once held the title of the world’s tallest free-standing structure. Completed in 1976, the Tower was originally conceived as a telecommunications facility to serve Toronto and the surrounding region. Webb Zerafa Menkes Housden Architects and John Andrews Architects International worked with engineers and contractors to design and build the structure. The Prix will be presented at the RAIC/OAA Festival of Architecture taking place May 24 to 27 in Ottawa. Recipients will also be acknowledged at the National Trust for Canada’s national conference and awards event in Ottawa on October 13. “This year the Prix du XXe Siècle celebrates combined achievements in both architecture and engineering design quality,” said RAIC President Ewa Bieniecka, FIRAC. “Both these projects deserve accolades for innovation. For the past four decades, these iconic places have captured the imagination and provided joy to their visitors”. The RAIC and National Trust bestow the Prix du XXe Siècle to promote public awareness of outstanding Canadian architecture and landmark buildings of the 20th century. Michael Heeney, FRAIC, principal architect for Bing Thom Architects in Vancouver.